Happy New Year! I hope your 2013 ended sweetly and your 2014 started with a bang! The husband and I “swept out” 2013 with a great group of friends at our house. My favorite part of preparing for a party is the planning and putting together of all the food. I like coming up with great recipes and laying out the food for prime party atmosphere. It’s like that IKEA commercial where the lady adjusts the flowers for her short aunt, moves the chair so the champagne cork won’t hit the chandelier, and makes sure the cookies are out of reach of little ones. SO fun! One of my standard party snacks is hummus and dippables. 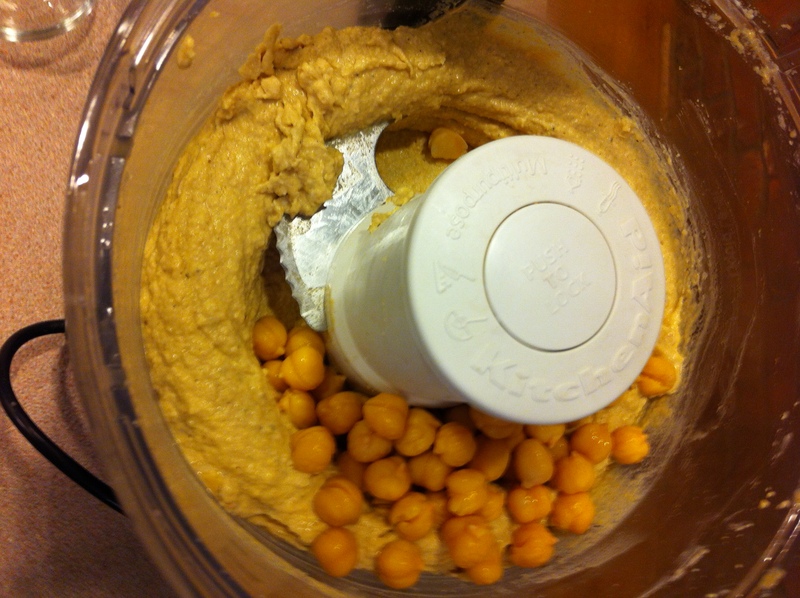 This past summer my go-to hummus was Summuh Hummus, available at my local farmers’ market. The husband and I could go through 2-3 containers in a week, easy. We’re buds with the lady who runs the booth, and we know that we have to arrive within the first hour if we want our pick of flavors. None of that helps me in late December. But this did. I had never successfully made humus before, so I appreciated Inspired Taste’s attention to not only the ingredients, but the process that makes for great hummus. They definitely know their stuff! The husband and I taste-tested this hummus compared to take-out hummus from a local Mediterranean restaurant, and this one won. Our NYE guests gave it rave reviews and polished it off, too. It’s a winner. I followed the recipe the first time for the NYE party, and I adapted it for myself again today for Meatless Monday. It’s that good. Feel free to jazz it up to match your taste, too. 1. Start slowly carmelizing the onions in a small pan. Add the butter as the onions start to cook. We want them super soft and slightly browned. Don’t rush it! This is important for awesome onion flavor. 2. 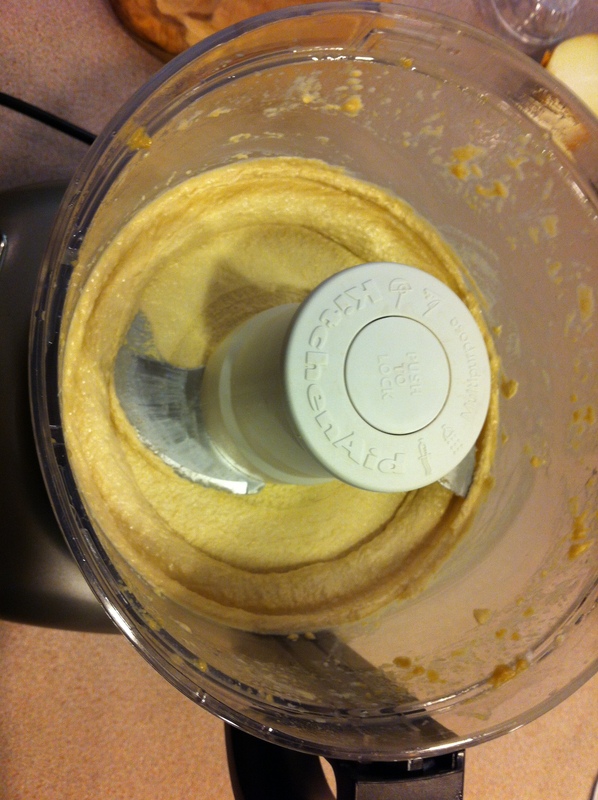 While the onions are becoming magical, dump the tahini and lemon juice into a food processor. Process for 1 minute, scrape down the sides, and process for 30 more seconds. 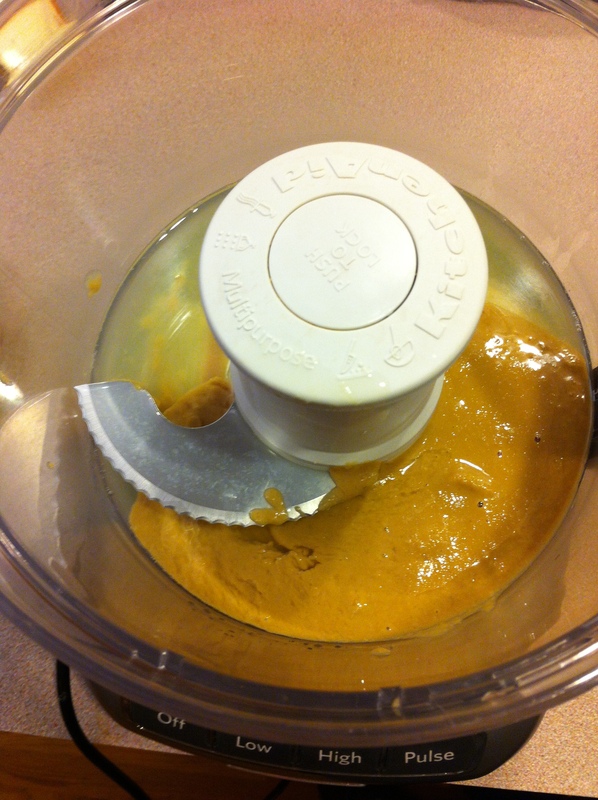 This really changes the texture of the tahini, which is key for really smooth hummus. 3. Add the salt, cumin, curry powder, garlic powder and olive oil and process for 1 minute, scrape the sides, and process for 30 more seconds. 4. 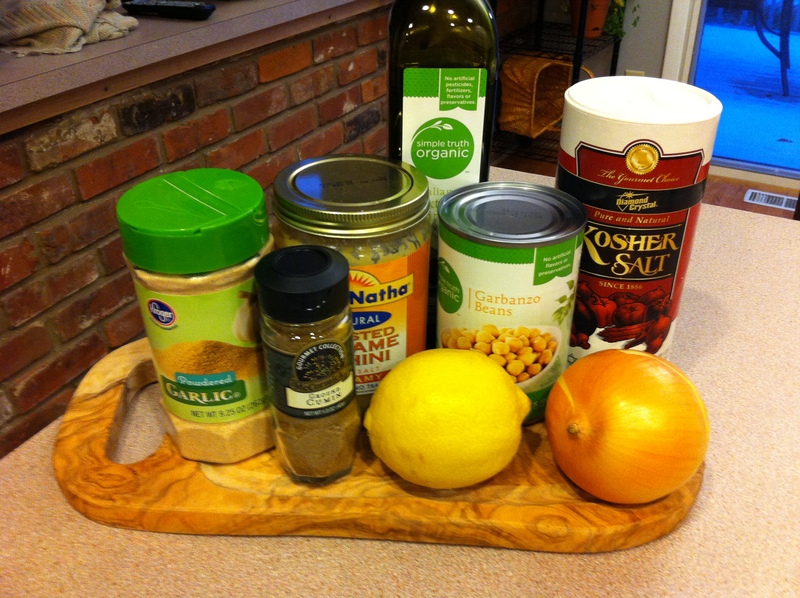 Add half the garbanzo beans and half the onions. Process for 1 minute. Scrape the sides and add the rest of the beans and onions and process for 2 more minutes. If the mix is a little thick for your taste, keep the food processor running and add a tablespoon or two of water until you get the consistency you like. I love hummus! 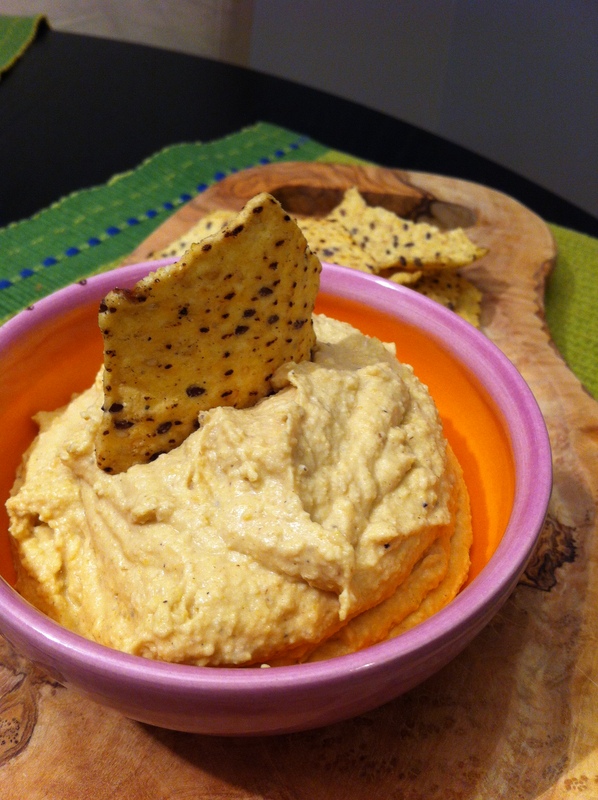 I have a few varieties on my blog and I just made a red pepper hummus that I am going to post a recipe for. Excellent! I will be checking those out! I’m excited to experiment with lots of different flavors. I’ll let you know how they turn out for me!